There are people behind every single thing that you use, from vegetables to high tech goods. Farmers, welders, shippers, programmers, chemists and tailors; every single working person contributes to our economy, and every single good you consume has a way of bringing people together across the world. Knowing the stories behind the people who make the things you love is inspiring. It gives more meaning to every object you use, and adds more appreciation to everything you do. Even something as simple as a paperclip connects and brings together miners, manufacturers, inventors, engineers, marketers, executives, and truck drivers. A product as storied and complex as tea is no exception. Let’s take a moment to get to know who brings us our daily cup, and in the process understand how labor contributes to what we pay. Some of the most dramatic price differences in tea come from the influence of labor on the process. The big determining factors are hand labor versus machine labor, ocean freight versus air freight, and packaging & marketing work. Any tea can be made better with more attentive picking, hand processing, and faster air freight to the end user. The extra labor that goes into marketing, branding and packaging do not increase the quality or final taste of the tea, but do increase the cost of production. 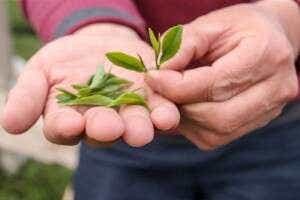 By far the most important labor that goes into tea is the labor of the farmers who grow it. On a small family-owned farm, usually one multi-generational family will perform all of the labor in the production process: from tending the fields, to picking the leaves, to processing and packaging. The He family in Laoshan Village is a perfect example. The family consolidates expenses by sharing a household, and growing their own food crops. They make about $90,000-$100,000 USD per year. The average Chinese income for a household is about $10,000 USD per year. The He family has their expenses to keep their business operating, but even after expenses, this puts them in a position to send their children to college, own a car, and most importantly, invest in development for the village by building a shared facility for tea farmers in Laoshan to increase production, encourage innovation, and form a cooperative. The He Family’s cooperative allows farmers who own land in Laoshan to use one facility and a shared set of tools to finish their own tea, instead of each farmer having to invest in their own duplicate equipment or decrease their yield. Contrast this small-scale model to the factory farming practiced for most export-bound teas. These begin with buyouts and land consolidation by an investor-backed enterprise. This company will displace small farms through buyouts and often hire back the displaced farmers as wage laborers. Laborers live separately from their families during production season in barracks, sending wages back home to support the family. Average wages for full time migrant agricultural labor in China are usually between $250 and $350 a month, or $3600 per year. This means a dramatically lower per-pound cost of labor. Despite labor cost, large companies have huge overhead costs in managers, executives, and marketing people. They are also paying off loans for large scale industrial equipment and paying dividends to investors for land buyouts. Compared to small family operations like the He Family, in many cases, this means that factory farms have a much higher pressure from labor per pound relative to the price they can charge. With so many layers of labor attached to their per pound cost, large factories seek other methods to save money, usually through mechanizing parts of the process, and farming for higher yield. We’ll take a look and compare the farming process for both models to see how they compare. Small-scale farms tend their land almost entirely by hand. For example, the He Family in Laoshan practices sustainable agriculture through careful crop rotation, major biodiversity in the field, and attentive cutting and trimming, all while completely avoiding pesticides and synthetic fertilizers. Instead, they grow soybeans to attract insects away from tea, mulching the majority of the crop at the end of the season to restore nitrates to the soil. They build canopies by hand to protect the leaves from sunlight during the high summer and from cold during the winter. When it is time to pick the tea, the whole family is up at 4AM and out in the fields to get the picking finished before sunrise for the optimum sweetness and flavor. Tea is picked one leaf at a time. 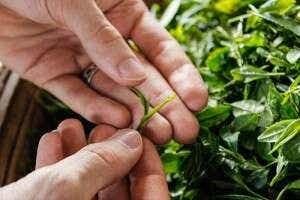 The average yield for one person is about enough leaf to produce one pound of tea in a day’s worth of picking. At peak season, neighbors help neighbors; aunts, uncles, and anyone with a skilled hand comes out to finish all the picking in time. Next, tea is taken back to the family workshop where it is allowed to wither on racks. From this point, it can be made into black tea, oolong, or green tea, each with different amounts of labor involved. Green tea will take Mr. He and his brother about five hours to finish a batch, with Mrs He, and her oldest daughter QingQing picking through the leaves throughout the process to check for quality. Black tea roasts for three days in the sun to oxidize before a five hour finishing process. Laoshan oolong takes 10-12 hours to finish. In a 16 hour day, five people’s labor is going to yield at best ten to fifteen pounds of finished tea with extra help picking. That means over five hours of labor go into a single pound of tea. That is 25 minutes of careful hand labor for a single ounce that you might purchase. There is tremendous opportunity cost for a family to devote so much time and labor to their tea. For example, the family could mechanize more of the process for less labor, at the expense of quality and control of the entire process. Yet instead, the family continues to choose to produce their tea using traditional farming techniques. Their daughter QingQing, who holds a college degree, could get a higher-paying job in the city. Instead, she works with her parents, and has even opened a tea shop of her own in nearby Jimo to help her parents share more tea. Is it all worth it? Mr. He says it is. First, cleanly-produced tea will ensure that his grandchildren inherit a healthy farm. With his first grandchild two years old at time of writing, responsible farming is on Mr. He’s mind. Second, as discussed on the article on lands contribution to tea’s cost, mountainous land make better tea, and you simply can’t run machine harvesters over rocky mountains. Third, the extra care in processing is important to Mr. He because higher quality tea helps him build a reputation for Laoshan Village. This reputation will help protect his land from development and raise the value of his tea for his children and grandchildren. For the end user – for the tea lover – the extra cost of labor is worth it because hand picked tea does not get broken or torn in production. This means less chance of dry, bitter tea. It also means the tea can be resteeped many more times than machine harvested tea, because the leaves are intact and carefully rolled, yielding a lower per cup price. 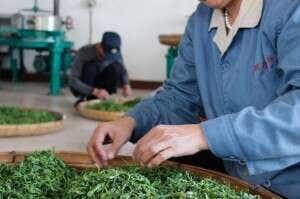 Picking tea is by far the most labor intensive part of the process. A single person just can’t pick more than a pound or two of tea in a day. On the other hand, machine cutters can pick acres of land in a single morning. These cutters indiscriminately chop a set number of centimeters off of the top of a tea hedge. The drawback is their requirement for generally flat land, straight rows, and no other plants, trees or obstructions in the way. 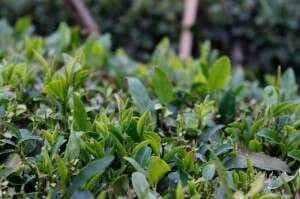 This means little-to-no biodiversity, and tea grown at lower elevation on increasingly depleted soil. Once picked, wage workers are often used to sort the broken leaves into grades depending, on how broken each leaf is. In some cases, this step can also be accomplished by specialized sorting machines. Next, the tea is mechanically dried and rolled in large batches. Because the soil does not lend complexity, black teas and oolongs are often over-roasted to mask the teas flavor with a dark roast quality. This makes for very simple and predictable teas that not particularly interesting from a flavor perspective. As an importer, we are constantly spammed with solicitations from these factory farms claiming to produce ‘pure’ and ‘authentic’ tea. Their price lists are shocking. We see tea as low as $4 per kilo! How can that be? When you take the labor out of the process, there are huge cost savings. 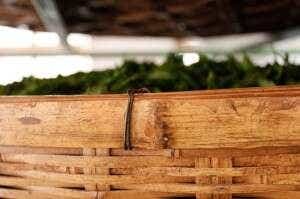 Hand picked and hand processed tea from a small farm takes hundreds of times more labor hours to produce. However, despite the cost savings, at the end of the day, it simply isn’t worth it to skimp on labor. This style of factory farming degrades the environment over time, produces boring flat tea, displaces populations, and keeps countless workers trapped in poverty. A low end tea costs you an average $3 an ounce, or 43 cents a serving. A hand picked tea can be resteeped 4-6 times, meaning that despite an average$8 an ounce price tag, it costs just 19 cents per serving. When we look at the math, and the people behind the product, we will always prefer to drink and share tea from any of our partner tea formers. Otherwise, we might as well be drinking hot water. In the next article, we take a look at shipping and brokerage. The way an importer gets their tea from the farm to the warehouse has a huge impact on price and quality. Continue reading here to find out how. Posted on September 26, 2014 at 3:39 pm. Sorry, I didn’t get to finish my comment from before. I now understand why my black tea from Laoshan has a rich flavor similar to cocoa nibs with a decadent sweetness and a smooth finish. I love your tea and will certainly return for more in the near future. Thank you, Joshua! That is one of our biggest goals. At the end of the day, I believe it should be no secret that it takes real, dedicated, and skilled labor to produce Laoshan teas – and ALL teas! It is our hope that it will someday soon be commonplace and normal for people to know who actually made their teas: the people behind the brew, rather than a pretty brand or catchy company name. Thank you so much for your kind support! I love the way you describe Laoshan Black . 🙂 I’m so happy to have helped connect you with the He family’s teas, and I know they appreciate your support, too!